The concept and use of reinforcement continuity strip systems or ‘pull-out bar’ systems has been widespread in Europe and further over the last 30 years, and is a widely accepted means of providing reinforcement continuity across construction joints in concrete. The system utilises the concept of overlapping reinforcement to provide a connection. The product design ensures fast and easy faxing by nailing to the formwork or tying to the existing reinforcement. Bars are quickly bent out using the specifically designed re-bend tool. When compared to traditional methods, the product offers a cost saving by means of a less labour intensive installation process and a simplification of formwork. 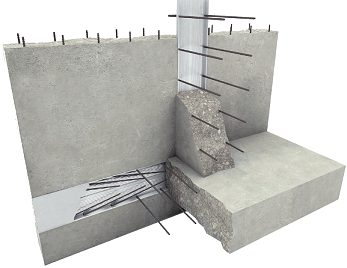 Most joints in concrete, on many different types of construction site, have the potential to be formed using Startabox. Startabox has been supplied to high rise commercial buildings, water treatment plants, hospitals, prisons, energy from waste facilities and many more types of construction site. For this reason, a full range of Startabox standard units are kept in stock for rapid dispatch. The range covers a wide variety of wall and slab thicknesses and caters for the most popular bar diameters and bar centres. Standard units can be easily ordered using the relevant stock code below.